I don’t know about you, but I’m starting to get a feeling this year’s furry content is coordinating their themes. It’s always interesting when common threads start to show up near each other, especially when they were not intentional. I remember when Fred Patten’s anthology Furry Future was thought to have had prejudice as a subtheme by a non-furry reviewer. It might have seemed odd that all but one story in the anthology touched on the idea of social inequities without coaxing from the collection editor, but it was just coincidence that the writers felt like writing stories about that theme at the time. It is surely strange coincidence that just after I played a game with a deeply ingrained theme of a protagonist diving head first into responsibilities to the point of self-detriment that there is an anime playing off this same subject released onto Netflix. However, unlike Yet Another Research Dog, which was a highly niche affair that probably only I had played of those I know, Aggretsuko was already slaying the fandom by the time I had gotten around to hitting the play button. So what is all the hub about and is it worth the hype? 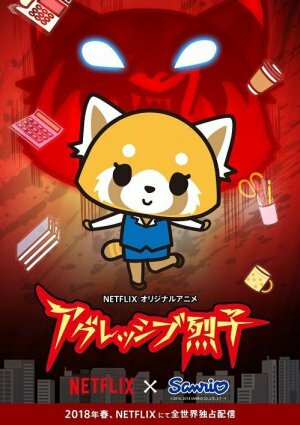 The show follows a young Japanese red-panda female named Retsuko as she goes to work for a large corporate farm, or did I just typo firm? You know what keep it, it works. She finds herself in the constant drudge of trying to get the books in line in the accounting department, with bosses constantly breathing down her neck. As things become overbearing and too hot, she will excuse herself to freshen up. And by freshen up I mean go into the restroom and slay in thunderous death metal flair. Screaming to the heavens above to strike down the system that keeps her grinding and slaving away. Each character represents an aspect of the office dynamic most are familiar with: the gossip, the goof, the gumshoe, the kissup, and of course the demoralizing demonic dickish boss. This is the part where I talk about the literal pig man that manages the department, Ton, and talk about their on the snout symbol of “patriarchy” and other such prose, however that’s been done to death. Instead I will note that the thing about the show’s characters is that by the end of the ten episode run you get glimpses that it isn’t just the panda that you follow around all day that has a hidden side. Each character gets more of their private side revealed to you in time, and Ton’s moment near the very end of the last episode is powerful in so many ways I could write a whole article about it in and of itself. But it’s a bit spoilery so I’ll save it for the comment section, or a Rooview. But just on that scene alone Ton went from one of the most loathed characters in my mind to one is probably one of my favorite characters of the show as they are the perfect foil protagonist. Where Retsuko’s aggressions are present and drive her forward through the day, she shouts her angers to the ether and doesn’t take it out on others. Ton does the opposite, publically burdening others with his aggression while privately being more somber. Both the protagonist and antagonist however, share a commonality in that when they put their mind to it and are pressured to do so, Ton and Retsuko can both pull their weight and accomplish the jobs of multiple colleagues at the same time. They are both effective, but their methods are worlds are generations apart. Anthro characters are a very useful tool in drawing out character with far less effort than utilizing human characters. But when good writing compliments the animalization, it creates a thriving character based story. Aggretsuko’s strength is its characters. Even the flattest role serves a purpose in the overarching story. And as one with a kangaroo fursona it is amusing that this flattest character comes in the package of a yoga instructor that takes in Retsuko as she desires a more fit body so that she can land a rich husband and quit her thankless job. It is through this kangaroo that she eventually makes a very powerful connection that creates a bridge between her life as an accountant and the one as a death metal slayer. All the while, the marsupial teacher never uses more than one word, which I may or may not have smattered on this article for obvious reasons. Each character plays a role in the story, and there is no wasted element. For those who find themselves frustrated by the daily grind of their job, they will connect with the situation, humor, and characters of this accounting department. One can also binge the season in about the amount of time as it took me to play though Yet Another Research Dog (if one coincidence of commonality wasn’t enough). But most importantly, even if you don’t like the Death Metal as much as someone like Spelunker Sal does, you’ll still enjoy the protagonist. Because to many furries out there, the human guise we place on work is just an aspect of ourselves that we put on for the day to day grind. But when the sun goes down, we let loose the beast within upon the world, and like Retsuko it is what makes us whole. Having the time, no matter how short and fleeting it may be, to unleash one’s passions is essential to getting through the day a little bit stronger than yesterday. And these animals are here to remind us how to best make the most of it in spite of our towering obligations. I've seen this mentioned all over. Maybe I should give it a watch. I thought about reviewing this one myself; I also thought about waiting a year as is Flayrah's usual editorial practice with these sort of viral things. The show doesn't really do a whole lot with the fact it's characters are all animals, other than the literal pig/metaphorical pig thing Ton's got going on and the secretarial secretary bird; in fact, I think the species of a character is mentioned one time outside of Ton, (when they're all freaking about about something Haida shouts "I've got a hippo down! SAVE YOURSELVES!"). This would be a complaint if this were a furry written story, but here the story is visual, and the character designs are nice (it's Sanrio). Lots of interesting animal choices, as well; red pandas aren't that rare even in non-furry fandom created furry stuff (Kung Fu Panda comes to mind), but usually are supporting. I've already mentioned hippos and secretary birds, but one of the most likable characters is a hyena, so that's nice, and there's also a gorilla. Fenneko the fennec fox's laugh has already gone viral to the point I thought it would be something like her catchphrase; I was shocked she laughs one time the whole show, though to be fair her laugh is funnier than the joke she's laughing at. I wasn't an editor back in 2011 to be fair. I'm trying to get better at picking up the pace as it were. Spoiler alert, the rib Adam looses is actually a chromosome, don't make me tell you Y. Please note: I am not, repeat, AM NOT taking responsibility for this thread. In addition, I would have held the "zipperback" thing against it more if I were Fred Patten. And I'm certainly no Fred Patten. It's not nearly as bad for a cartoon show to not really do anything thematically with animal characters because cartoon shows are a visual medium and the animals add visual appeal. So the characters being animals still serve a purpose. In a written story (a non-visual medium), this is a problem, because there's no point in adding visual appeal to a character the reader can't see (and, okay, if you are really, really descriptive with your prose, constantly reminding the reader, maybe you can work it, but Patten usually goes out of his way to point out that the furry authors he's complaining about don't do that, either). The characters being animals no longer serve a purpose. I think the problem a lot of furry authors have is that they look at something like this (or, for that matter, something like Robin Hood, where the characters being animals is just about the single most arbitrary thing ever) and say "But this works!" And it does. In this medium. Different mediums have different rules, and what works in one medium does not necessarily work in another. Of course, that's if I'm understanding your term "zipperback" correctly ... otherwise, the other reply might be really gloriously dumb. I been following Aggretsuko when the show was a few minute short on Sanrio Japanese YouTube Channel. I find Agreetsuko and in addition Gudetama ( the lazy anthro egg) an interesting adult departure from kawaii (cute) of Hello Kitty and My Melody. The show is complex in the way it deals with Japanese office culture but is relatable to those outside Japan. Currently Sanrio is conducting it 33rd annual character ranking poll. Over all Agretsuko is not in the top 11 but by country , she is in the top three spaces in Western countries and the UAE. National Zoo suffers another loss.